The DPx Gear HEAT Hiker is a small, lightweight fixed knife ready for the campsite, boat or trail. 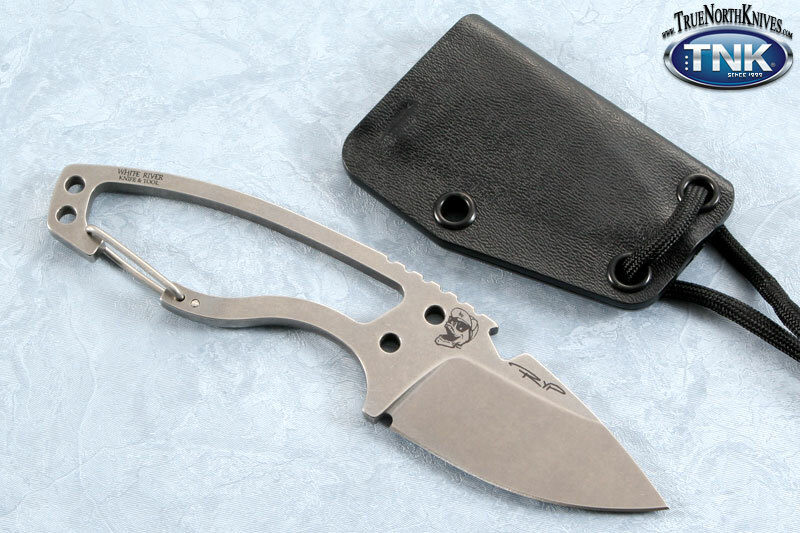 It's unique non-load bearing carabiner handle clip allows the knife to be instantly and easily clipped onto gear helping reduce misplacement and loss. Composed from a full tang of CPM-S30V stainless steel that has been STONEWASHED finished for an even tone and non-reflective matte finish, the Hiker feels at home in a small to medium sized hand. Surprisingly comfortable, the handle is scale-less with several paracord attachment points. Jimping along the spine also offers an extra bit of control. Bottle opener cutout just above the thumb ramp for those stubborn to open brews. Includes a molded kydex sheath with paracord and break-away attachment for neck carry. Made exclusively for DPx Gear in the USA by White River Knife & Tool. Sheath Description: Tactical Black KYDEX?